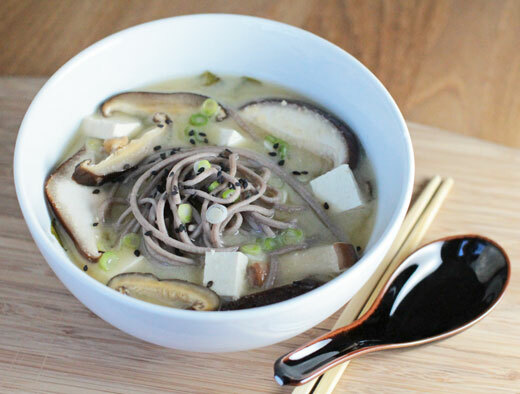 This Miso Noodle Soup makes a quick, complete lunch. 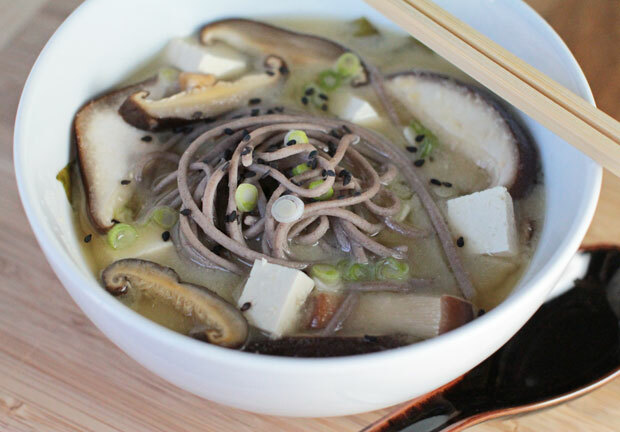 No microwavable kit is necessary; you can make your own healthy miso noodle soup from scratch in under 15 minutes and skip the loads of sodium and other questionable ingredients often found in instant soups. You will need to stock up on some special pantry items in advance, though. I’ll walk you through these now. If we’re going for a healthy, high-protein option, not to mention gluten-free, then 100% buckwheat soba noodles are our first choice. 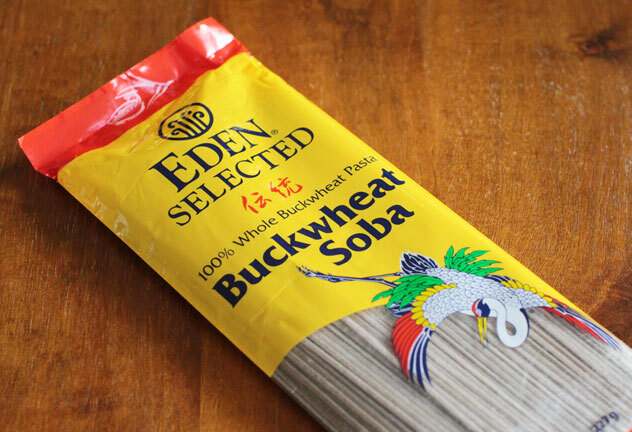 It’s important to note that not all soba noodles are made entirely of buckwheat (most brands use a combination of regular wheat and buckwheat). So if you’re picky about quality or you need them to be gluten-free, then you’ll want to check the ingredients. My go-to brand is pictured at left, Eden. There is only one ingredient: whole buckwheat flour, which makes them a bit pricier than other kinds. The best price I’ve seen for these is at Vitacost.com. (If you’ve never shopped at Vitacost before, use this link for a $10 credit.) You can usually also find them at WholeFoods Markets. And, if you want to stock up, you can get a 12-package case from Amazon for the best per-unit price of all. 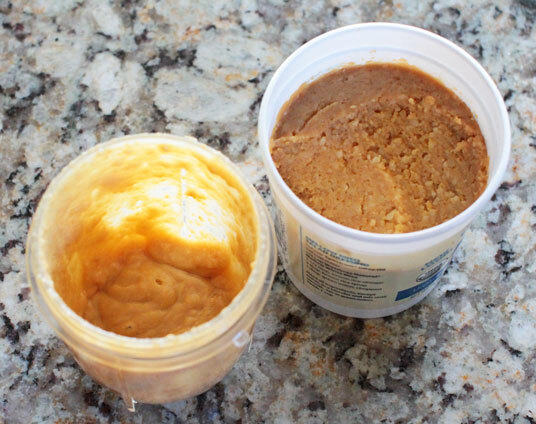 Miso pastes vary widely in flavor and quality. For this recipe, I recommend a mellow-flavored (light-colored) miso, like the one pictured at left, Organic White Mellow Miso from Westbrae Natural. This miso is a fermented food and is not pasteurized. This means that all those healthy microbes and enzymes are still intact, and will remain that way, imparting their benefits to you, if the soup is prepared properly (see instructions below). I pick mine up in the refrigerated section at my local Wegman’s store, but you can also find it at WholeFoods and likely at other healthy supermarkets. If you’re not able to find it at the store, you can order Eden Genmai Miso from Vitacost ($10 credit for new customers) or Amazon (slightly higher price) and refrigerate it after opening. As with any soy product, buy organic to ensure that you’re getting non-genetically-modified, natural foods, since much of the non-organic soy available on the market today is a GMO product. Seaweed seems to be a universal ingredient in miso soup. As far as I’m concerned, the more, the better. It’s an excellent source of iodine, an important nutrient that can be elusive if you tend to use (non-iodized) sea salt in your cooking, as I do. 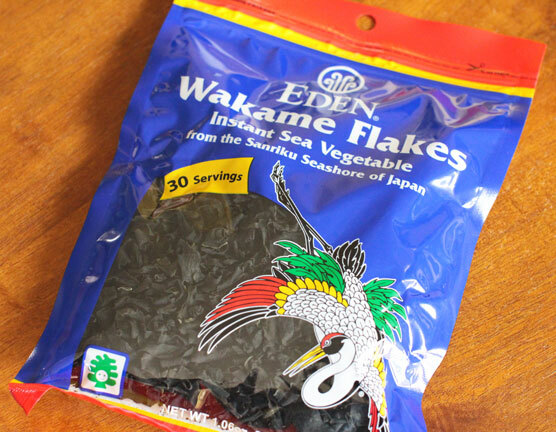 And the package also notes, “Research has found that wakame helps reduce blood pressure and cholesterol levels, and improves metabolism of fatty acids.” I get the Eden brand wakame flakes pictured at left at my local Wegman’s or WholeFoods. Another option is to order Emerald Cove brand from Vitacost ($10 credit for new customers) or Amazon. I’m really wild about the flavor of shiitake mushrooms. Although I’ve included both dried and fresh shiitakes in this recipe, it’s not necessary to have both. 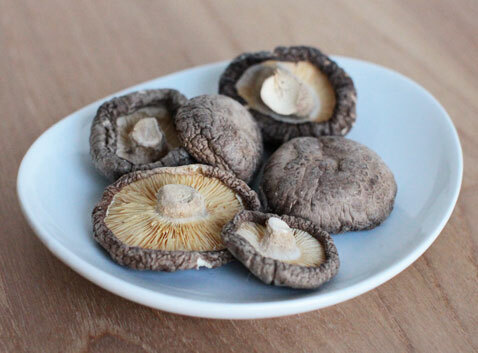 Sometimes you can find fresh shiitakes at the supermarket (or farmer’s market), and that’s wonderful if you can get them, but often I use only the dried ones in my pantry. I get mine from Mountain Rose Herbs (organic, whole), but you can also find them on Amazon, Vitacost and Nuts.com. It doesn’t matter whether they’re whole or sliced. Of course, you can find tofu anywhere. I get mine at Trader Joe’s for three main reasons: It’s organic (and therefore non-GMO), the soybeans are sprouted before being fermented into tofu (making the nutrients more bio-available), and it is packaged as two separate half-blocks of tofu, which is a more appropriate size to open and use up in time for our small household of two people. When cooking with tofu, drain the water in the package, wrap the tofu with a clean, dry dish towel, and press out as much of the remaining water as you can before chopping and adding it to your meal. I prefer the texture of extra-firm tofu, but choose whatever firmness you like best. The rest of the ingredients don’t require any introduction, so let’s get started with the recipe! These quantities make 2 main-course-sized bowls of Miso Noodle Soup. Bring 4-6 cups of water to boil in a medium- or large-sized saucepan. The exact amount of water doesn’t really matter, but buckwheat noodles do better when they have a lot of space. Add the soba noodles, and begin stirring immediately to prevent them from sticking together. Continue to stir them periodically, somewhat vigorously, as they cook, for the time indicated on the package instructions (mine says 8 minutes). Once they are cooked to your preferred texture, drain the cooking water and drop the noodles into a bowl of cold water to stop them from cooking any further. You can also rinse them thoroughly with cold running water. Drain and set aside. While the noodles are cooking, we’ll start on the broth. 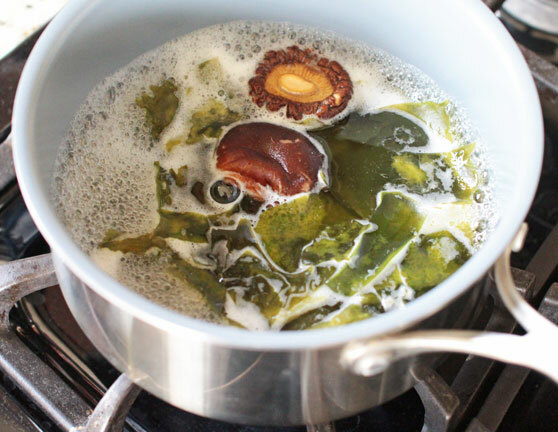 Put 4 cups of water in a saucepan, along with the sliced ginger, 4 dried shiitake mushrooms and wakame flakes. Bring to a simmer and allow the ingredients to infuse into the broth water for about 5 minutes. It’s almost like making tea, really. If you love shiitakes as much as I do, but aren’t able to get fresh ones, you may want to add a few more dried ones to your soup, in addition to the ones flavoring the broth. In that case, you’ll need to reconstitute them. In a small bowl, cover a handful of dried mushrooms with boiling water, and allow them to soften. Once soft, drain the water and slice the shiitakes. The next step is to drop the cubed tofu, fresh and/or reconstituted shiitakes and the sliced green onions into the broth, just for a minute or two to let them heat through. Using a ladle or measuring cup, spoon about a quarter cup of the broth into a little bowl or blender. Try to get as few of the floating ingredients into your scoop as you can, but you don’t have to be neurotic about this, especially if you’re using a blender (they might get in the way a little bit if you’re stirring by hand – one reason why we’re trying to do this separately). I love using my Magic Bullet for this task, because it makes it so quick and easy. But you can easily do this by hand using a bowl and whisk or fork. Add the 3 Tbsp. of miso paste to the broth that you separated out, and blend or whisk until smooth. Remove your pot of broth from the heat source. This is important, because we don’t want to boil the miso, in an effort to protect its probiotic and enzymatic benefits. Add the blended miso to the pot of soup and stir to incorporate it. Apportion the broth into two large soup bowls. Distribute half of the noodles into each bowl, and then sprinkle the soup with your choice of toppings from the ingredient list. I recommend using at least a splash of soy sauce, but sesame seeds and a little lemon juice really enhance the flavor. And there you have it. The whole thing can come together within 15 minutes, making a really nice, comforting homemade lunch that’s loaded with healthy nutrients. Give it a try and let us know what you think in the comments below! One 2-oz serving of all-buckwheat soba noodles provides 6g of protein (about the same as an egg), as well as phosphorus, iron and zinc. 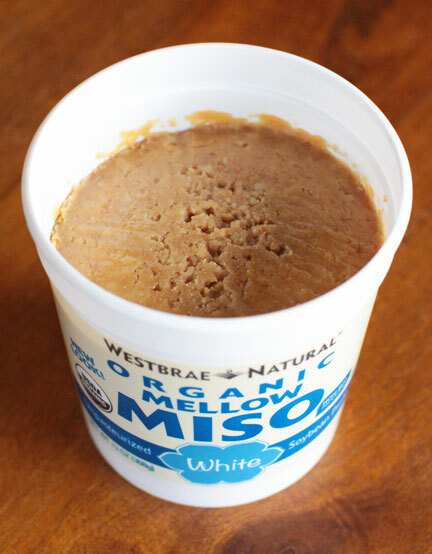 High-quality miso, like the one recommended above, is a fermented, unpasteurized food. Every culture has it’s own fermented food, from German sauerkraut to Korean kimchi, Bulgarian kefir, Indian yogurts and Japanese pickled vegetables, among many others. There’s some wisdom to that, as they add good bacteria to your digestive tract, which impacts the balance and efficiency of your whole body. 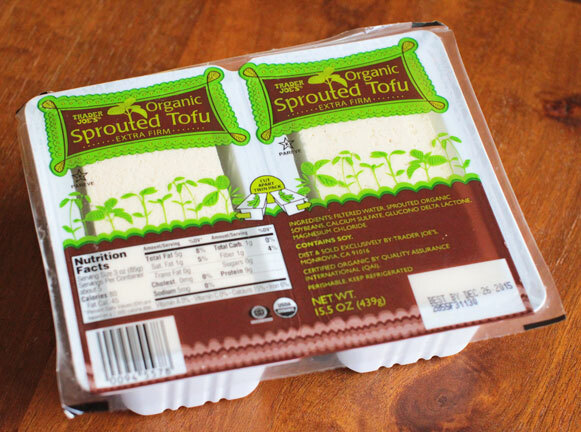 Tofu is high in plant-based protein, calcium and iron. It’s nutrients are even more available to the body when the soybeans are sprouted before being made into tofu, as the germination process in effect breaks down the components, making them easier for the body to digest. Some research suggests that shiitake mushrooms support the immune system, as well as the cardiovascular system. They have also been recognized as a good plant-based source of iron.